(vûr`nēr), auxiliary scale, either straight or an arc of a circle, designed to slide along a fixed scale. Its unit divisions, usually smaller than those on the fixed scale, permit a far more precise reading. The vernier is attached to the scales of instruments employed for very accurate linear or angular measurements; these include the transit, sextant, barometer, compass, and caliper. It was devised by a French mathematician, Pierre Vernier, who described it in his Construction, usage et propriétés du quadrant nouveau de mathématiques (1631). Certain auxiliary control mechanisms used for fine measurements or adjustments are often called verniers. (ver -nee-er) A short scale used to increase the accuracy of the graduated scale to which it is attached. If nine divisions of the vernier correspond to 10 divisions of the instrument scale, the latter can be read to a further decimal place. (1) In instrument making, a device for the exact reading of lengths or angles from the fractional divisions of a scale. The operation of the vernier is based on the eye’s capacity to establish with certainty the coincidence of two lines when one of them is a continuation of the other and their ends overlap. The vernier is a movable scale that can slide along a fixed, basic scale; the divisions on the movable scale are somewhat finer than those on the basic scale. If the interval between the divisions of the basic scale is represented by a, and the interval between divisions on the Vernier is (a - a/n), then the vernier allows the primary scale to be read with an accuracy equal to 1/n of its division. The divisions of the vernier are figured in corresponding fractions of the division of the basic scale. If the zero line of the vernier (index) is located between the two lines c and c + 1 of the basic scale, then the reading is equal to c plus that indication of the vernier which is located opposite the line that best coincides with a certain line of the basic scale. The vernier was invented in 1631 by P. Vernier (1580-1637), the director of the mint in Franche-Comté, and it was named in his honor. (2) In radio engineering a device for the exact tuning of radio receivers and other radio equipment. the Portuguese P. Nunes, latinized to Nonius, who proposed a similar device as a means for reading fractions of scale divisions; this device is no longer used.] There are several types of vernier: linear (Figure 1, a), goniometric (Figure 1, b), spiral (Figure 2), and transverse (Figure 3). Figure 2. Spiral vernier. 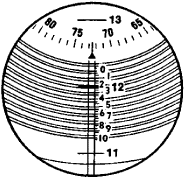 In the field of vision are the lines of the main millimeter scale (11, 12, 13), one of which is within the zone of ten divisions of the small scale, and also a part of the circular scale, which consists of 100 divisions and two equidistant Archimedean spirals. For reading, a division of the millimeter scale must be in the exact center between two adjacent spirals. Readings are made sequentially on all three scales. Figure 3. Transverse verniers: (a) Linear vernier (transverse scale). A division of the main scale (72) intersects one of the diagonal lines on the vernier. Readings are made according to the location of the point of intersection of the lines and the diagonals. 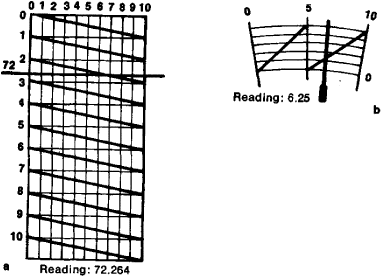 (b) Goniometric vernier; its principle of reading is similar. number of opticomechanical instruments) is the same as for a linear vernier. The operation of other types of vernier is explained in Figures 2 and 3. Gorodetskii, I. E. Osnovy tekhnicheskikh izmerenii v mashinostroenii. Moscow, 1950. A short, auxiliary scale which slides along the main instrument scale to permit accurate fractional reading of the least main division of the main scale. An auxiliary scale sliding against and used in reading a primary scale; the total length of a given number of divisions on a vernier is equal to the total length of one more or one less than the same number of divisions on the primary scale; makes it possible to read a principal scale much closer than one division of that scale. Be to, jai budingi ir iprastos Vernier velinimo linijos trukumai--reikalingas dvieju velinimo liniju elementu velinimo trukmiu DBD ? As of Monday afternoon, Vernier has not been arraigned on the felony charge of conspiracy to defraud financial institutions and no court hearings have been scheduled yet. Similarly, homogeneity was maintained in the bivariate distribution in all the Vernier and caliper measuring methods, but variation increases with increasing body size in the photo method (Fig. According to the Vernier instructions, the oxygen sensor will lose calibration more readily if not kept vertical. Once roughly focused, I take a series of images of a bright star, making small focus adjustments between them and noting the vernier reading for each one. Not only does the deal safeguard 20 jobs but also gives Vernier the perfect opportunity to centralise all of its presswork operations at the firm's 15,000 sq ft site at Pipers Road, Redditch. I didn't want to leave my friends,'' Vernier said, adding that she also likes Canyon High School and the administration. Grifton had been beaten three-quarters of a length and two lengths by Vernier in the GP Cruzeiro do Sul (Derby), on April 26, and was returning to the distance over which he had won the GP Jockey Club, with Vernier three and three-quarter lengths third, on March 29. In a GR&R test, repeatability also is termed equipment variation, such as with a vernier caliper or micrometer. Vernier Networks delivers the industry's leading Network Access Control and Security solutions that are designed to ensure network security and compliance.